If you haven't met loyal TNFP volunteer and board member Judy Wright, then you are missing out! Judy cooks regularly in our kitchen and she shares with us so many great recipes (Judy's Mom's Meatloaf, anyone?) and tips for the kitchen and garden. Judy regularly shares her impressive knowledge through her blog at JudysChickens.org, and periodically we'll be sharing some of those posts. Today we've got a great post from Judy on a TNFP recipe - oven-roasted strawberry and rosemary jam. Summer. In. A. Jar. The local strawberry season is too short for many of us; just six weeks. Have you ever wanted to capture the smell and flavor of a just-picked, warm, lusciously ripe strawberry? If so, try making a jar of this oven-roasted strawberry and rosemary jam with a touch of lemon juice or balsamic vinegar. This recipe was given to me by my friend, Malinda Hersh, Associate Director at The Nashville Food Project, and it is easy to make. Malinda made this jam three years ago, packaged in half-pint mason jars, for TNFP’s deluxe gift baskets prepared for attendees of the Nourish Patron’s Party held annually at the legendary Bluebird Cafe. Inspired by Malinda’s gift, I have been making my own small batch of this jam every year since, as soon as the venerable Tennessee strawberries come in. Nourish is a Nashville fundraiser which brings together the South’s most innovative chefs for an evening of delicious food and wine. This year the event will take place on July 28th at the Hutton. The idea for this post started last week when I read in Edible Nashville, a gorgeous publication on local food trends, for which I am now a contributing writer on gardening(!! ), that the first Tennessee strawberries were starting to come in. On a whim, I emailed Hank Delvin at Delvin Farms at 7:00 A.M. to tell him I had this fabulous recipe for roasted strawberry jam that I wanted to make and by-the-way, I was looking for ripe strawberries. He said they were getting ready to pick that morning and invited me to come along. I love driving out to Delvin Farms in College Grove, Tennessee. It’s a beautiful drive, and I know I’ll always learn something new about botany and organic growing practices from Hank, and his dad if he’s around. Check out this post from last year when I chronicled a morning spent gleaning vegetables for TNFP at Delvin Farms. The most interesting tidbit I learned on my most recent trip was the concept of incomplete pollination. Like for many of you, I’ve seen the results of incomplete pollination, misshapen berries like the ones in the picture below, I just didn’t know there was a name or reason for it. By the way, misshapen isn’t alway ugly. Look at this amazing strawberry I found in the field. My friend, Roberta, said it looks like an angel. Indeed. Hank plants new June-bearing strawberry plants in long rows of plastic-covered raised beds every September. The plastic keeps the weeds out, since, as an organic farm, they do not use chemical weed-killers. The plants go dormant in the winter and start growing again in the spring. Once the delicate flowers start blooming, it is imperative that the tender blooms be protected from frost. To this end, whenever the temperature dips, Hank’s staff has to cover the rows of strawberries with agricultural cloth. This past spring there were six such frosts in the three weeks preceding their first harvest. Strawberries are considered self-pollinators and as such, their male and female parts are on the same flower. It takes gravity, the wind, rain, and some insect pollinators to move the pollen across the flower to pollinate it. If the plants are covered, the wind and bees can’t do their part. The strawberry flower is not your typical flower. Yes, it has the male parts which are the yellow pollen coated anthers known as stamens. And it has the female part called an ovule that connects to an ovary and collectively is known as the pistil. However, whereas most flowers only have one pistil, the strawberry is an aggregate fruit and, as such, has as many as 500 spike-like ovules, each one an immature egg needing to be pollinated so it can produce seed. The more of those ovules that get pollinated, the bigger, puffier, and more perfect the strawberry. Clean and hull two quarts of strawberries. Figure on four cups of berries in each quart container. Allow berries to macerate for two hours, or up to 24 hours, stirring regularly to re-incorporate the sugar that sinks to the bottom of the bowl into the mixture. Don’t skip this step. It’s what helps the berry chunks keep their shape. Pour the macerated strawberries and the lemon juice into a large saucepan. Bring to a rolling boil over high heat. Be careful not to let the juice boil over. Once the mixture reaches a full boil, reduce the heat and continue cooking, uncovered, for ten minutes. About five minutes into the cooking time, add the rosemary sprigs to the pot, stir, and continue to cook. Cooking the berries and sugar together helps release the naturally occurring pectin from the strawberries. Pectin is a gum-like substance that is needed to “set” jams and jellies. It occurs naturally in fruits, but more can be added in the form of powder if a faster set is desired. Adding an acid, such as lemon juice or vinegar, helps fruit release its natural pectin. For more on pectin, read my post about making grape jelly. How to test hot jelly for gel formation: Use a chilled wooden spoon to scoop up some jam. Allow jam to cool and then tilt the spoon so jam drips off. If the drips form a triangle-shaped thick flake, it is ready. Don’t get too hung up here with the testing. After 10 hours, assume it is going to be great! I love the combination of strawberries, a little sugar, and balsamic vinegar, so I often substitute four tablespoons of balsamic vinegar for the lemon juice. The balsamic vinegar not only flavors the jam, but it also gives it a smoother, earthier taste than the lemon juice. Having said that, my kids prefer the lemon juice version. 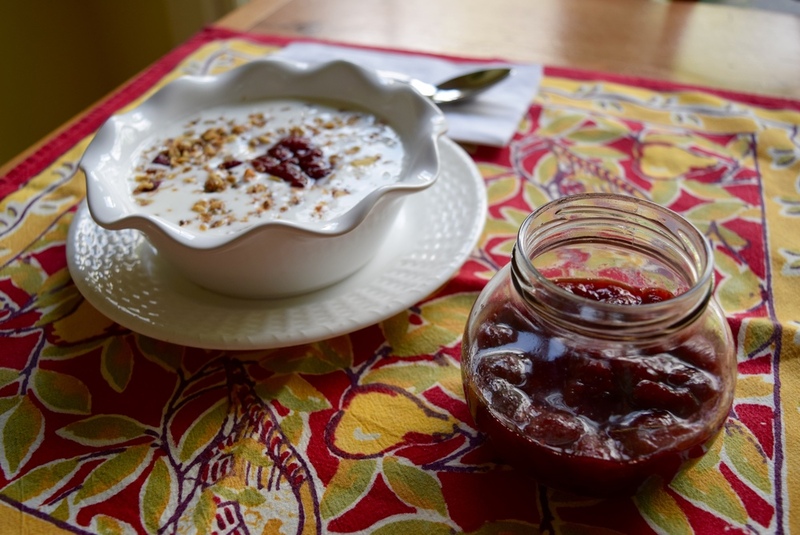 I love this jam spooned over @judyschickens granola and served with plain, low-fat kefir. The Nashville Food Project brings people together to grow, cook and share nourishing food, with the goals of cultivating community and alleviating hunger in our city. Their primary fundraising event, Nourish, will take place on July 28th this year instead of in June. The Patron’s Party for this event is at the legendary Bluebird Cafe and will take place on July 13th. Tickets go on sale May 20th. © 2016 Judy Wright. All rights reserved.